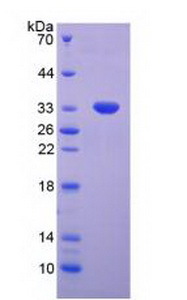 Small volumes of TP53 recombinant protein vial(s) may occasionally become entrapped in the seal of the product vial during shipment and storage. If necessary, briefly centrifuge the vial on a tabletop centrifuge to dislodge any liquid in the container`s cap. Certain products may require to ship with dry ice and additional dry ice fee may apply. NCBI/Uniprot data below describe general gene information for TP53. It may not necessarily be applicable to this product. p53: a transcription factor and major tumor suppressor that plays a major role in regulating cellular responses to DNA damage and other genomic aberrations. Activation of p53 can lead to either cell cycle arrest and DNA repair or apoptosis. More than 50 percent of human tumors contain a mutation or deletion of the TP53 gene. p53 is modified post-translationally at multiple sites. DNA damage induces phosphorylation of p53 at S15, S20 and S37, reducing its interaction with the oncoprotein MDM2. MDM2 inhibits p53 accumulation by targeting it for ubiquitination and proteasomal degradation. Phosphorylated by many kinases including Chk2 and Chk1 at S20, enhancing its tetramerization, stability and activity. The phosphorylation by CAK at S392 is increased in human tumors and has been reported to influence the growth suppressor function, DNA binding and transcriptional activation of p53. Phosphorylation of p53 at S46 regulates the ability of p53 to induce apoptosis. The acetylation of p53 appears to play a positive role in the accumulation of p53 during the stress response. Following DNA damage, p53 becomes acetylated at K382, enhancing its binding to DNA. Deacetylation of p53 can occur through interaction with SIRT1, a deacetylase that may be involved in cellular aging and the DNA damage response. p53 regulates the transcription of a set of genes encoding endosomal proteins that regulate endosomal functions. These include STEAP3 and CHMP4C, which enhance exosome production, and CAV1 and CHMP4C, which produce a more rapid endosomal clearance of the EGFR from the plasma membrane. DNA damage regulates a p53-mediated secretory pathway, increasing the secretion of some proteins such as Hsp90, SERPINE1, SERPINB5, NKEF-A, and CyPA, and inhibiting the secretion of others including CTSL and IGFBP-2. Two alternatively spliced human isoforms have been reported. Isoform 2 is expressed in quiescent lymphocytes. Seems to be non-functional. May be produced at very low levels due to a premature stop codon in the mRNA, leading to nonsense-mediated mRNA decay. 1. astroglial density was significantly higher in the "super p53" retinas than in the WT ones.